Camille is an elite operative who works to maintain order for Piltover's established powers. It was her dedication to duty that led the Steel Shadow to transfigure her body into a hextech-powered death machine. When Camille's tracking a target, she's calm, relentless, and terribly precise. 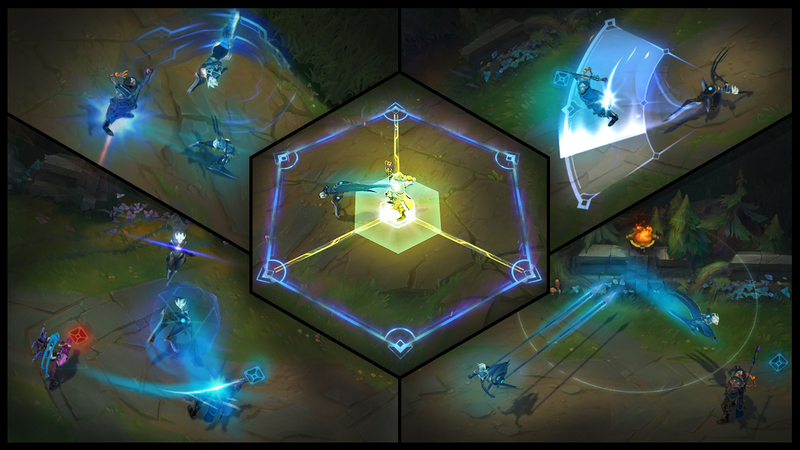 Camille's basic attacks on champions grant a shield against her opponent's primary damage type. The shield's strength increases based on Camille's max HP. 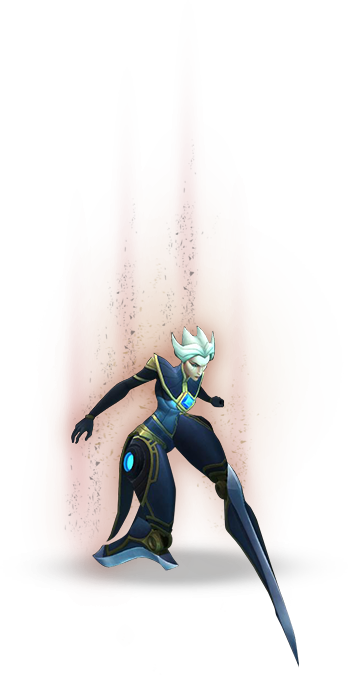 Camille's next basic attack slashes the enemy for bonus physical damage and grants a short burst of movement speed. For a brief period after the initial cast, Camille can recast Precision Protocol for an additional strike. If she waits for a short period of time, the ability's second attack will deal extra bonus damage and is partially converted to true damage. Camille gathers energy, then blasts it forward in a cone, dealing physical damage to all targets hit. Enemies caught in the outer half of the sweep will be greatly slowed and take additional damage based on their maximum HP, healing Camille in the process. Camille fires a hookshot in a target direction; If she strikes a wall, she'll pull herself to it. She'll then have a brief window to cast Wall Dive. Camille dashes in a target direction, stopping at the first champion hit and stunning all enemies in an area. If Camille dashes towards a champion, the range is increased and she gains bonus attack speed. Camille leaps onto a targeted enemy champion, imprisoning them in a zone and knocking away their allies. While the Ultimatum is active, the targeted enemy can't leave the area by any means. This arena deactivates on its own after a brief period (or if Camille leaves the zone prematurely). While in the zone, Camille's basic attacks deal additional magic damage. Camille is a highly-mobile fighter who's very good at pursuing and slaying single targets. When she seeks a fight, she always gets it—and she's often the better performer in a one-on-one dance. Those who play as Camille must share the Steel Shadow's appreciation for precision. Each of her skills must be carefully placed and paced for maximum effect. If you play her properly, you'll slice into the enemy backline, dice your target, and grapple your way out of the fray. Camille's mobility and dueling prowess make her ideal for a solo lane. With items like Ravenous Hydra, she's great at split-pushing, especially since Precision Protocol grants her two auto-attack resets to use on towers. She can Hookshot around the map, applying pressure and slinging effortlessly away when enemies try to stop her. Although she has to be careful when maneuvering around teamfights, Tactical Sweep and Hextech Ultimatum allow her to set up kills for bursty allies who want to drop huge spells (like Veigar's Primordial Burst or Xerath's Rite of the Arcane) into Hextech Ultimatum's arena. Camille can simply Hookshot in, Sweep her opponent off their feet, then deliver a very painful tango lesson while her team moves in to drop the curtain. Like other champs that demand razor-sharp ability executions, Camille is noticeably less effective in the hands of an unpracticed player. Aside from her basic mechanical demands, most teamfights require you to be particularly creative with your approach—you've got to Hookshot in at the right moment (when enemy CC is down), preferably from an unexpected angle. The Steel Shadow isn't very effective as an initiator, unless she's using her ult to hold down a lone target while her team catches up. Since Camille's shield is specifically based off of her opponent's damage type, it's far less effective in teamfights than it might otherwise be in a one-on-one duel. Locking down that exposed AD carry likely won't be enough when a fed Syndra comes storming in. AOE champs in general are tough for the Steel Shadow: she'll want to slip past enemy abilities entirely, not muscle through a wall of explosions.